Hotel Medea opens this weekend! Jorge Lopes Ramos is co-founder and artistic director of Zecora Ura Theatre Company. After his early career as an actor in Brazil, Jorge has worked consistently as a theatre director in London for many years. His work has toured internationally and it is known for its innovation and boldness. 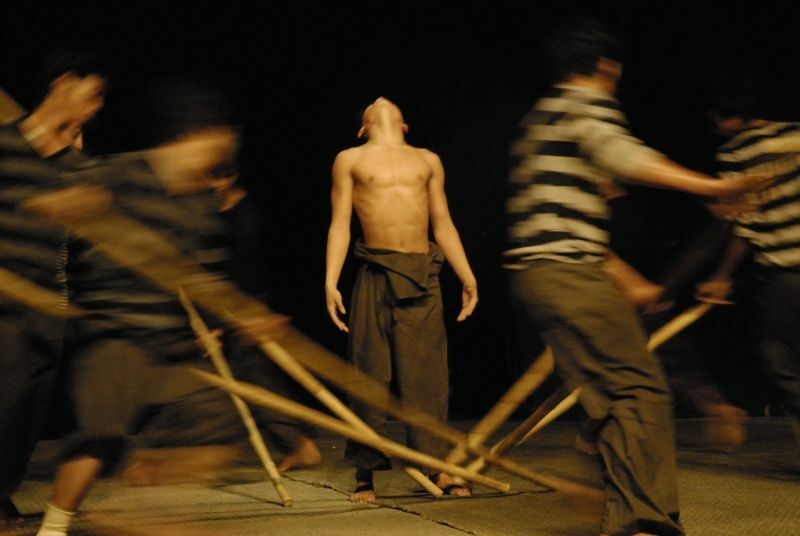 For the past five years Jorge has also taught worldwide in his radical approach to theatre- The Body as a Channel. Zecora Ura & Persis-Jade Maravala’s Hotel Medea trilogy and the stand-alone event Zero Hour Market opened last night at the Hayward Gallery. Hotel Medea has three parts – Zero Hour Market, Drylands and Feast of Dawn – it is an extraordinary and unique theatrical event that offers both spectacle and intimate performance. What initially attracted you to the idea of an all/late-night show? As we trained as an ensemble through the night we were aware of the interesting ways the body reacted in staying up all night, how some things in us would harden but other things would fall away. And also ask ourselves why, when first light approached was there always such an air of togetherness and achievement, as if we as a group could feel triumphant in successfully fending off the dark fiends of the night. In a way choosing to stay awake is also a means of defying death. How have you been rehearsing for this? We have set up The DRIFT Project in over 9 countries in the last 6 years as a residency for artists to meet through the medium of live performance. During these two-week residencies we have developed many of the core ideas in the show and invited participating artists to join or company of collaborators. We now work with a team of thirty five plus artists, including performers, designers, writers and DJs. Different parts of the production were developped through comissions in its early stages of development by Salisbury International Arts Festival and CPC Gargarullo, Rio de Janeiro, and later through public seasons in Rio, London and Edinburgh. What impact do you imagine it having on the way the audience engages with the experience? The myth of Medea, as long and as painful as it is, actually takes place overnight in the narratives of most interpretations and we were drawn to this idea of passing through this night with Medea, beginning with the discovery of the betrayal and ending in the killing of the children. We wanted to pass through it collectively, as a group, one group -audience and actors together re-enacting the myth. Why Medea as a source? Where new notions of art and cultural action are integrated with new technologies and a new version of the myth is proposed. Through our realisation of examining our changing relationship to myth our project becomes a new way of looking at the world, and a way of constructing alternative views (by proposing ‘new’ realities, different options – making the familiar unfamiliar). We turn to mythology to explore a modern dilemma. We attempt to bring to life the idea that technology like mythology is not about opting out of this world but about enabling us to live more intensely within it. As our circumstances change we need to tell our stories differently to in order to bring out their timeless truth. We review our mythology and make it speak to the new conditions. But of course we also see that human nature does not change very much and Medea still addresses our most essential fears and desires such as the foreign; the unknown, and that which we cannot understand. Do you think doing a show like this is something like this works most effectively in a city like London and its almost unrelenting business? Would it actually work better elsewhere? Whilst questioning ourselves as to why (having come from Rio de Janeiro and further) we should continue to work as directors in London, we had the impulse to investigate a theatre piece that would defy London’s convenient after-work theatre culture. The desire came to create work which would not comply with safe programming requirements but offer a real experience, which would consist of sharing a space dark and quiet, somehow covert and hidden, and end by walking into the city at first light – which is a totally different city to the one normally experienced. We also wanted to experience a different type of contract with the audience, that by being there the audience have already crossed a boundary, agreeing to accept the challenge of staying up all night, to make this sacrifice. We would require the audience to take a huge risk and defy the ordinary culture of receiving theatre, re-defining theatre as experiment and as an exchange to put all we have into making it as truthful and as honest an experience as possible. Catch Hotel Medea at Southbank Centre’s Hayward Gallery from Friday 20 July – Saturday 11 August. Get tickets here.